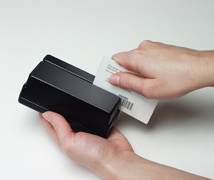 Portable or fixed mount Barcode reader for Data Collection. The Smart Slot DC is a data collection reader available as a portable reader or as a fixed-mount reader. Scanned data is saved in memory and can be uploaded to a pc at any time. This reader is designed for applications such as scanning at entrance gates, school attendance scanning, and training session attendance scanning. The reader has a built-in time clock for stamping each transaction with the date and time, and can detect duplicate reads. Models are available for use with an external 9-volt battery (or AC adaptor), with an internal battery, or both (internal battery and AC adaptor). Units are also available as fixed-mount readers. Fixed-mount versions are available with POE. For detailed software information visit the Software Page.